Please sign up to volunteer at Music In The Parks on May 11 & May 18! 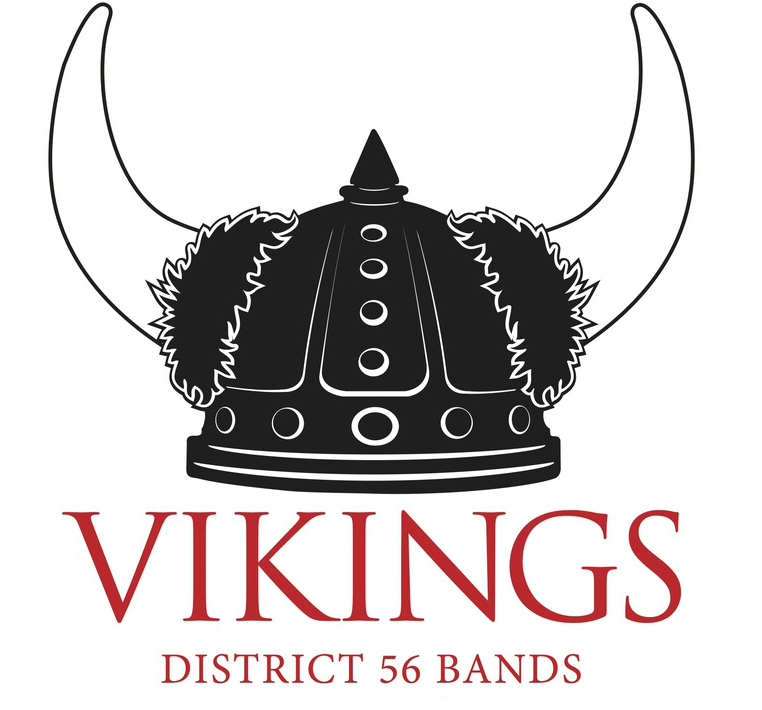 Welcome to the D56 Band website! Sign up to volunteer! We have many events throughout the year that we need parent volunteers for. Take a look through our sign-up genius to find something that interests you. If you would like to donate to the Paul Kundert Private Lesson Scholarship Fund follow the link! The Viking Symphonic Band is made up of all 7th and 8th grade musicians who have played at least a year and have met the playing requirements set by the director, Mr Boswell. The band performs between 5 and 6 times during the school year and tries to participate in at least 2 contests each year. It is a performance based group that will perform a difficult selection of music, challenging each young musician to play at their highest level. ﻿The Concert Band is composed of sixth grade students and is directed by Mr. Eikenberry. For most of them, it is their third year of playing. By now, they know most of the fingerings on their instruments. It is also a time to introduce more low brass and low woodwinds, to expand the instrumentation of the group. This band performs between 5 and 6 times per year and participates in the North Chicago Band Festival. The Viking Marching Band is made up of all 6th thru 8th grade band members. The marching season begins in late July with our Gurnee Days Rehearsals and ends in late September or early October with our performance in the Warren Homecoming parade and the Warren HS Marching Festival. Drum major and color guard try-outs are held in May and are open to 7th and 8th graders. The Viking Jazz Ensemble is a select group of 7th and 8th grade musicians interested in performing big band jazz music. This group of 22-25 students will play 8-12 “gigs” each year ranging from a school pep assembly to a dinner party at the local country club. This band will perform 25-30 charts over the course of a school year and will make it’s annual CD of their favorite tunes in May. This group rehearses M,W,F from 7:00-7:25 AM in the Viking band room and is directed by Mr. Boswell. The Viking Jazz Band is a lab ensemble with a single focus. Take the young musicians at Viking who aren’t in the Jazz Ensemble and give them an opportunity to experience playing jazz music. This group features no cuts and deals with the very basics of playing in the jazz style. They will perform a few times during the year and be on the year-end CD. 6th-8th graders are welcome!!! this group meets T,TH mornings from 7:00-7:25 AM in the Viking band room and is directed by Mr. Eikenberry. This is where it all starts! This band consists of fifth graders in their first year of band. These students definitely have the hardest job as they learn to play their instruments and learn to play together as a group. The band performs twice during the year. Beginner Band rehearses every day at school during the school day and is directed by Mrs. Farster.